We use a lot of purchased streaming services such as Amazon Prime, Netflix, and NHL Gamecenter. In the US, you can watch them anywhere on your phone, tablet, computer, or TV. When you are traveling in Canada, they usually do not work as the company has not bought the rights in Canada to the movie you want to watch. Seems unfair, you bought the service, and you cannot use it. The simple solution is a VPN (Virtual Private Network). This capability routes your internet traffic through a server or node in the US so the content provider thinks you are located in the USA. There are a couple of ways to get a VPN set up. First, there are services that you can buy and some that are free that use someone else's node in the USA. Second, we use our own home router as a VPN node so everything is routed through our home network. If you have a recently purchased middle to high end home router, or if your router supports DD-WRT, you can set up your own VPN. The ideal person to help you set this up is your child, who probably is the most capable internet expert in your household. If you have to do it yourself because you do not have a child at home like me, here are the basic instructions. Get out the router manual and read how to set it up as a VPN server. It will normally have a screen in the user interface that allows you to turn on the VPN, and set up accounts for yourself and others. The screen below shows one user "whittonm" and the space where you would assign a password. You also need to click the field to "set the DDNS". This allows your Ipad to find your network when you are traveling. Copy the name of the DNS aka server. Now we need to set up the client on the Ipad that you will use when traveling. On your Ipad, you would go to settings, then look for the VPN button on the left under settings. Click this button, then select "Add VPN Configuration". 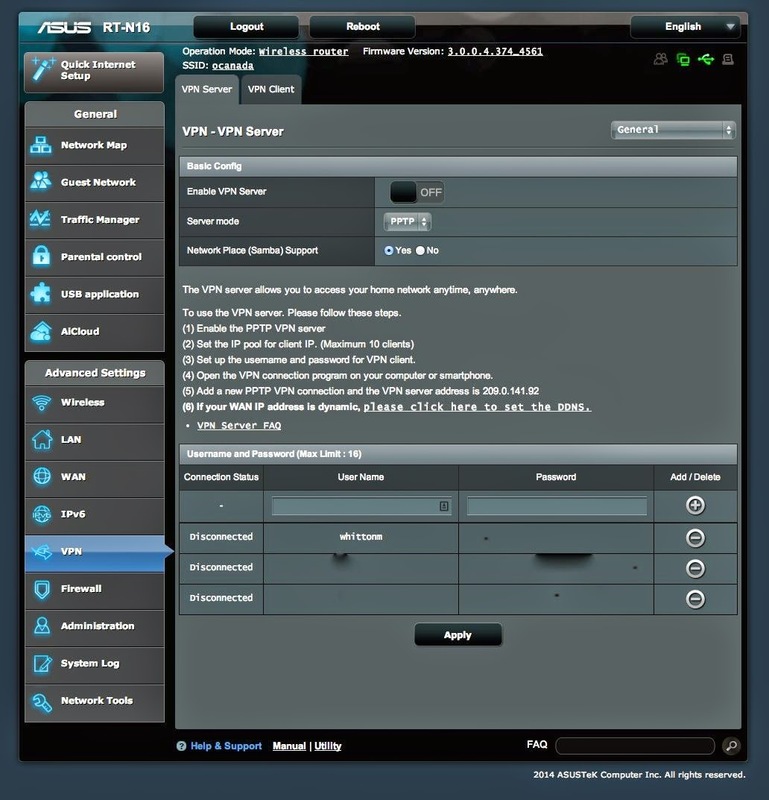 Select PPTP on the top of the table (this is a type of VPN). Fill in a description "My Home VPN" for example. The server is the DNS name from item 2. Account is the account name you assigned, in this case "whittonm". The password is the password you assigned. Make sure the "send all traffic" switch is green as this will route all traffic through your home network. When you want to turn on your VPN on your Ipad, go to the VPN section in settings and turn on the switch at the top of the screen that says VPN (it will show green). When you are connected, you will see a little box with VPN in the upper left corner of the Ipad screen next to the wireless status. You set up VPNs on your laptops in a similar fashion. There are other uses for a VPN such as accessing files on your home network and encrypting traffic when you are on a public network, but I will not get into these. You will need to set some other parameters to get things like encryption via IPSEC. Also, this blog posting is not to help you steal content, it just helps you get the content that you legally purchased.